Pemberton Tyres-backed racer Tony Lynch was able to rescue a podium finish from a difficult weekend as the Monster Energy British Rallycross Championship returned to Mallory Park for the fourth round of the year. Westhoughton-based Tony made the trip to the Leicestershire circuit looking to build on his first win in the BMW MINI class in the previous round at Knockhill, with hopes high of challenging for top honours for the second successive meeting. It would prove to be a challenging weekend for the Lucas Oil Team Geriatric driver however, with damage to his car sustained in a heavy landing during the second of three heats playing a part in him only qualifying in fourth place for the final. Despite that, Tony remained optimistic about his chances at the wheel of his ever-improving car, but he was unable to make up a place at the start when he was forced to back off while trying to go three-wide into the opening corner. Eager to try and make up places, Tony was unfortunately left battling simply to get his car to the finish when a heavy landing on the same bump that had caught him out during the heats left him with damaged suspension, with his focus then being to make it to the chequered flag to pick up vital points for his championship challenge. 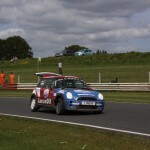 A late puncture for rival David Bell allowed Tony to make up a position before the finish to claim third spot, but it was very much a case of what might have been after a weekend that saw him slip to third place in the championship standings. “On paper, third seems like a decent result, but if I’m being honest, I’m disappointed that we’ve not come away from the weekend with a lot more,” he said. “We headed to Mallory on a real high after the win at Knockhill and were confident that we’d be right in the mix for victory again, but it just didn’t go our way. “In the heats, I had a solid enough run in race one but then in race two, I moved off-line to try and get more a clearer view through the dust and hit a bump in the circuit which caused damage to the radiator and cost me a place. In the end, I was on row two for the final and I hoped to be able to follow Kris Hudson at the start but he got away slowly and I ended up boxed in at turn one. “Despite that, I thought we could still challenge at the front until the suspension got damaged and from then on, it was a case of getting the points. I’m not afraid to admit that we were gifted third when David had his puncture, but I’m not going to turn down the extra points.